Yes it been a full 4 years since I opened up my Robo Advisor account. For those new to investing, a Robo Advisor is a new wave of wealth management companies that invest on behalf of others using an online platform and a combination of algorithms and computer coding to buy and sell specific investments and manage portfolios. Four years ago these firms were just stepping into the investing conciousness, but since then they have mushroomed and even traditional investment companies are now offering some flavor of online investment management services. It all seemed quite appealing however there was one thing that many marketing materials, blogs, and mainstream media was avoiding (and still are I might add)…do these types of services make money for investors? Since no robo advisor company back then was interested in disclosing their performance (they still avoid it) other than citing research that their strategy is superior, I decided four years ago to try an experiment and find out for myself. I setup an account with one of the big Robo Adviser firms. My goal was to go through the process and blog about my experience and more importantly, the results. I’ve always said that we need a good five years to really get a handle on how effective these services are compared to traditional wealth management services. Well, we’re at the 80% mark of my ROBO journey, so let’s check back in and take a look at how it’s doing now and see if we can squeeze any conclusions about the service. 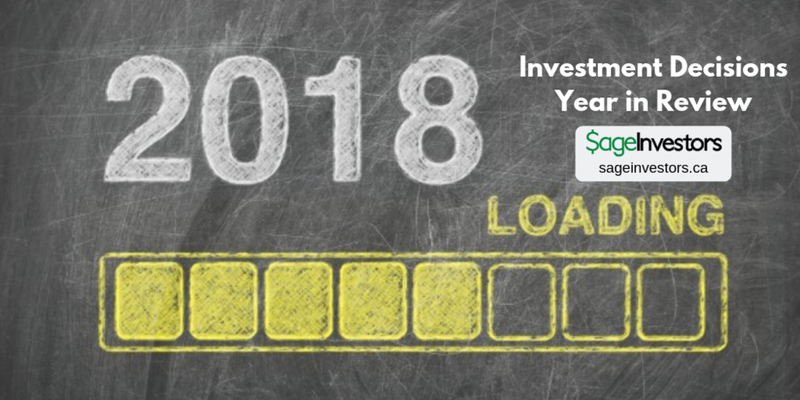 Throughout the year I’ve shared with you the investment decisions I’ve made. It’s important to me that as someone that teaches people how to make better investment decisions, that I model the concepts and principles I teach. Well it’s that time of the year where in this episode I walk it back and see what I did right and more importantly what I did wrong…and what if anything did I learn from the experiences of the past year that will help me become a better investor? One of the most under performing asset classes so far this year has been German equities. As of this writing, German stocks were down over 20 percent year-to-date. Everyone complains about the weakness in the Dow Jones indexes, but the German markets have been in a serious downfall. This despite some of the most well-known and dominant global companies like Daimler Benz and Seimens. The German economy is the enginge of Europe and the opportunity to get exposure to that market at a 20 percent discount was appealing to me. I decided the best way to get the exposure was to passively own a basket of German stocks and that led me to evaluate some German equity ETF’s. In this podcast episode, I walk through my analysis of several German equity ETF’s. Oil prices have been nose diving in the past few months and along with it oil stocks. I thought it would be a good opportunity to do some due diligence on some oil stocks to see if there were some opportunities to buy low. Instead, I decided to have a look at some ETF’s to see what if that may be a better road. 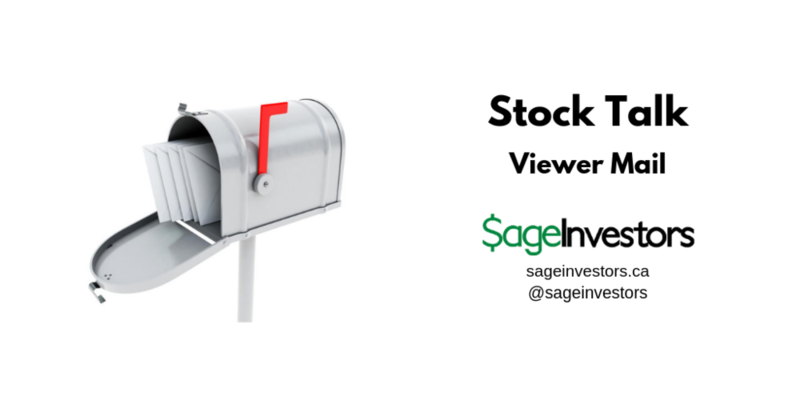 In this episode I share my analysis and review of several energy ETF’s. There was a fair bit of hand wringing going into October, a month where there have been historically some iconic stock market meltdowns. The market was starting to show some signs of fatigue. At one point the S&P 500 index crossed below its 200 day moving average which hasn’t happened in literally years. Interest rates keep tracking up. The Mad King continued to elevate the trade trash talking and investors were getting nervous and stock prices in the early part were trending downward, but nothing crazy that motivated me to look into buying. Sue enough on October 23, the market had a fit. Suddenly words like “crisis” and “turmoil” were being thrown around, when historically they weren’t even scratches. It’s times like this where having my investing playbook is critical as it gives me an anchor to check in and review my investing ideology and how should be executing. It makes me review my Wish List to see if there are any stocks I’ve liked are now more affordable. The last thing I should be doing is panicking and reacting. It’s these stress points where we need to be put all the upfront hard work and making thought-out decisions. In this episode I walk through the various decisions I made during the month. With quite a few stocks that I owned had fallen in value enough that I thought it was worth jumping in and buying some more shares to lower my average cost down. There were also a couple of stocks/ETF’s that I had on wish list that had become a lot cheaper and thought it would be good to start building a position. With Emerging Market stocks taking a hit, I thought it would be a good time to explore building up a position in the sector. In this episode I evaluate several ETF's to determine which would be an appropriate one to add to my portfolio. Amazon has been one of the “It” stocks for the last decade. It has had an epic run. If we were to look at Amazon from a 1st level thinking perspective, the conventional thinking behind buying Amazon is that they are disrupting retail. Any space Amazon enters, be it grocery, streaming, pharmaceutical drugs, diapers is met with fear and doom by the existing players. 1st level thinking would tell us that in the future we will shop at Amazon only. I would consider Amazon to be a Fear of Missing Out or FOMO stock. Many have missed the moves up and feel compelled to jump aboard so they won’t miss out. In this episode I try to take a look at Amazon from a 2nd level thinking perspective. I’ve owned Las Vegas Sands in the past and it has been good to me. I’ve also sold it prematurely because of some questionable financial reporting treatments that didn’t sit sell with me. With the stock down near 14 percent this year and at a 52-week low, I thought it may be worth revisiting it to see if anything with the company has changed. As from my position in MGM, many of the fundamentals with LVS are quite similar. The question is how are they performing. In this episode, I apply my 8 Questions framework and see if indeed an opportunity is at hand. This decision was also a very difficult one because there is also some politics at play here. With summer done, I was thinking I may be due to make a few investment decisions, but it was quiet month with one selling decision which I wasn’t counting on making anytime soon along with one decision to buy more shares and one new stock I added to my portfolios. At the same time, I was faced with a decision that challenged some of my personal values and given the times we’re in, I don’t think I’m the only one that may be facing similar decisions. In this episode I walk through my most recent investment decisions from September. In Part 1, I shared some thoughts on a recent report by the Ontario Securities Commission (OSC) outlining the challenges the financial services industry is having in getting Millennials to invest. The OSC report had a great opportunity to address those investing pain points, but like so many financial literacy initiatives, the messaging is not clear, consistent, and understandable. The report identifies solutions, yet they are separate and not integrated and use a lot of industry jargon that people just won’t connect with. They emphasize processes over results. What is the outcome we want Millennials to achieve with investing? In this episode, I’d like to share from my experience as Investment Coach and as someone who works with people to develop their investing competencies, some ideas that I found have better motivated people and not just Millenials into become more engaged with investing. They address the pain points people have with expressed about investing which include; being scared of investing, feeling overwhelmed by the process, feeling paralyzed when trying to make a decision, and not knowing how to start and take that first step. These are my takes and perspectives. They are by no means the most definitive and all encompassing. My motivation in starting my own practice to teach and engage people on investing revolved around financial literacy. I thought that if I could improve someone’s financial literacy, they will have a better chance at becoming a successful investor. I was always a big supporter of financial literacy programs, especially in schools. It made sense and I thought it was the right thing to do. The reality is over the years I’ve learned and witnessed first-hand that while noble and done with good intentions, financial literacy programs just don’t work. A revolving door of programs, a lot of them government and industry sponsored have been rolled out over the years, starting out with enthusiasm and then just petering away in obscurity. Here in Canada, we even have a Financial Literacy Commissioner that acts and cheers Canadians into becoming more financially literate, but to no avail. So much effort, again all with good intentions, has been put into improving financial literacy but it just doesn’t seem to stick. So queue the latest attempt at cracking the financial literacy daVinci Code. A 42-page report commissioned by the Ontario Securities Commission and prepared by a dream team of consultants and personal finance thought leaders. The report attempts to answer why people, specifically Millennials are not investing and what financial institutions can do to get them to invest. In this first of a two part series, I walk through the report and highlight some of the good points as well why the industry continues to make the same mistakes when it comes to engaging people about investing. In Part 2, I offer some some solutions that I have developed from my own practice and from my own experience helping people make more successful investment decisions. We’re half-way through the year and so I thought it would be a good time to check back into my ROBO portfolio to see how it’s doing and if there is anything interesting going on. Three and half years ago I decided to try an experiment and find out for myself. I setup an account with one of the big Robo Adviser firms and invested $5000 of my own money into it. My goal was to go through the process and blog about my experience and more importantly, the results. I said that we need a good five years to really get a handle on how effective these services are compared to traditional wealth management services. Well, we're coming upon the 4th anniversary of my ROBO account, so in this episode I take a look at how it’s doing at the mid-year mark. As an Investment Coach, I spend a good amount of time working with people who are new to investing. Often one of the first questions I get from someone who is new to investing is "I want to learn how to invest are often in the form of: What stocks should I buy?" or "I have $10,000 I would like to invest. What stocks should I buy for the next 10 years?" 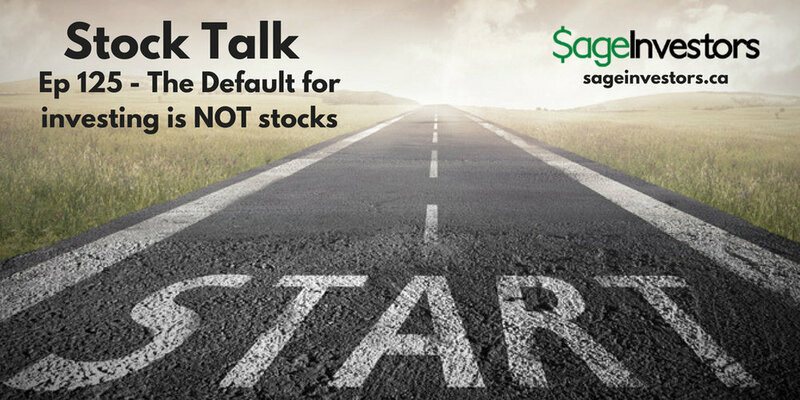 I've been asking myself lately, why people believe that default position for investing must involve buying and selling stocks? The reality is buying and selling Facebook or bank stocks should not be your first thought when it comes to investing. In this episode, I try to figure out why people have this mindset and how it can have a devastating impact on your investing experience.